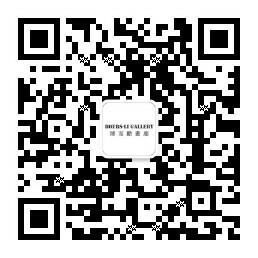 Boers-Li Gallery is pleased to announce the solo exhibition of Liao Guohe, Popular Painting, which will open March 15, 2012 in Gallery II. This exhibition will showcase more than 10 new works by Liao Guohe. The title, Popular Painting, has multiple meanings. It points out a deliberately obscured relationship between the artwork and our immediate reality; one of public anxiety in China fed by the news, weibo and absurd marketplace rumors about housing, power, food safety, etc. But it is the artists' peculiar approach that transforms the work into a mixed graffiti-style map. This composite style is also a type of absurd aesthetic language that includes the mumblings of striking and strange writing while embracing crude characters, vague intimations, and more. 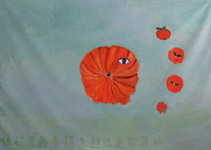 Since his first exhibition Liao Guohe's work has been labeled as “bad painting.” But perhaps it is in his most recent creations, with his many methods of symbols and images that enable him to negotiate a painting, in which he demonstrates a departure from his self-expressive, “bad painting style.” In his work, what we see is a crude approach towards painting and symbols, but this approach gives vent to emotion and at the same time exposes the artist's great distrust and suspicion of both image and narrative. 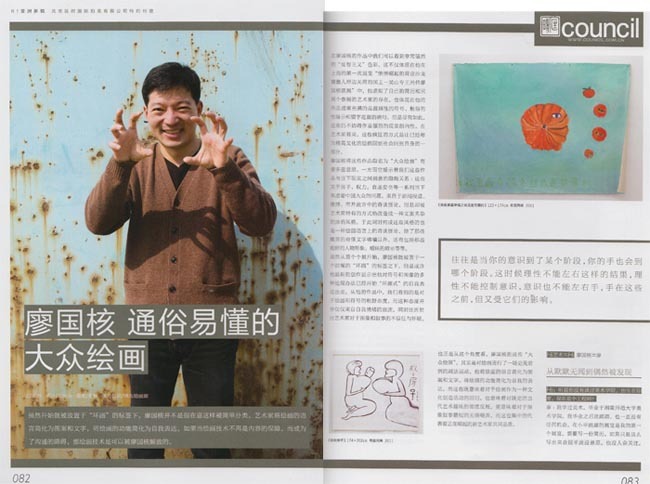 It is from this perspective that we see Liao Guohe's, Popular Painting, stand in open revolt of the established contemporary art aesthetic, as a ruthless mockery of the hegemony of image and narrative, and of the new emerging artist's common quality. Liao Guohe was born in 1977 and graduated from the Hunan Normal University art department, having worked in media, education and now as a professional painter, he lives and works in Changsha.